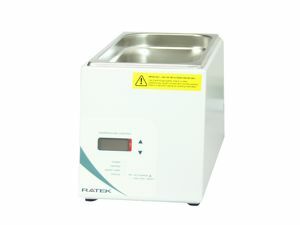 The WBx000D range from Ratek is the latest generation of water baths from Australia’s favourite laboratory equipment brand. Designed completely from the ground up with temperature uniformity, safety and reliability in mind, the new range is packed full of features. The WBx000D baths can be utilised in a wide variety of biomedical, life science, and industrial applications as well as food and wine testing, and are available in 2, 5, 11 and 17 Litre capacities. The efficient use of bath space means smaller fill volumes, faster heat-up and less power usage when compared to other brands with a similar working area. All models feature precision digital PID control with LCD display combined with simple up and down temperature control buttons. A large concealed heater heats the entire base of the bath giving excellent spacial uniformity, whilst an independent safety monitor provides 3 levels of thermal protection. The tank is constructed from a single piece of food grade stainless steel with seamless corners making cleaning a breeze. All baths are supplied with a removable stainless steel guard that protects the user from the heated surface whilst giving a sturdy platform to work on. A wide range of accessories are available, including gabled polycarbonate or stainless steel lids, concentric ring lids and floating polypropylene balls. Ratek’s most advanced water baths to date offer simplicity with performance and can be run day in day out. Waterbaths are utilised in a wide variety of biomedical, life science, and industrial applications as well as in commercial kitchen cooking techniques such as Sous Vide. Specific applications include Sample Thawing, Bacteriological Examinations, Warming Reagents, Coliform Determinations, and Microbiological Assays.